Boo! Not enough time or energy to make paste! We’ve finally got some joy out of our backyard garden. Three raised beds (the fourth strawberry one doesn’t count because it is not expected to produce in the first year) and all we got was garlic, decent peas, decent lettuce, some kale, ONE zucchini…and a lot of failed everything else. 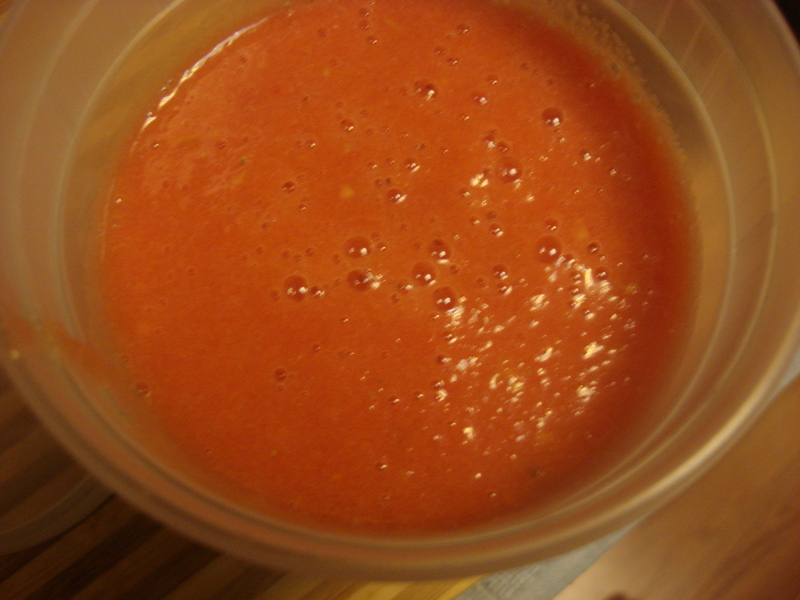 Therefore I am inordinately happy about the fact that I have harvested a couple of pounds of paste tomatoes, with more greenies getting pink on the vine. So…here’s the easy way to deal with the ones we’ve picked on a Thursday night, near collapse from the workweek and doing a million other things at the same time. Didn’t bother cooking them down. The raw fresh taste will still be there in the winter! 1) Get a big pot of water on the boil. 2) Get a bowl of ice water ready. 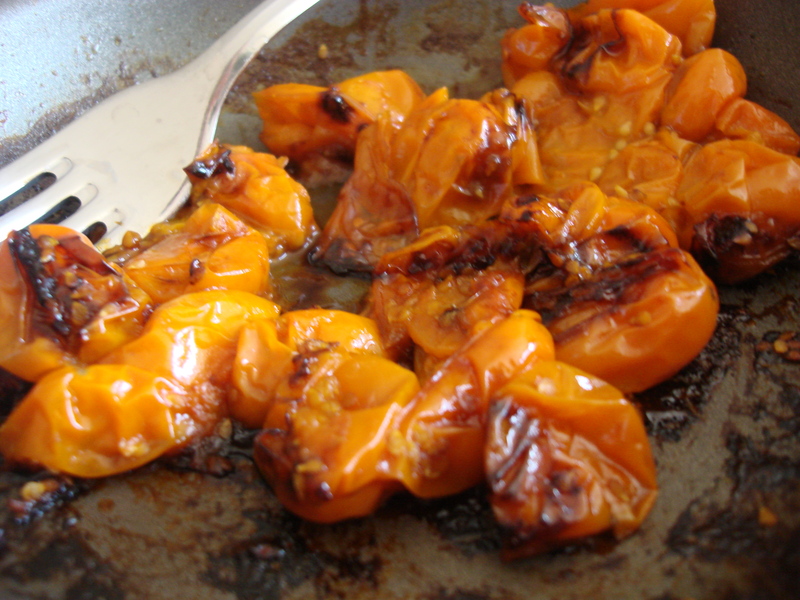 3) rinse the tomatoes (if you must). 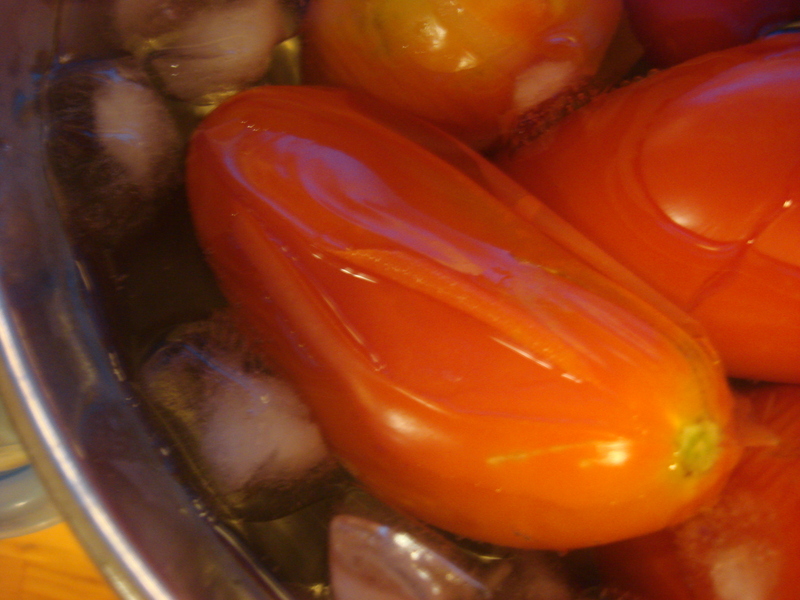 4) drop tomatoes in the boiling water. 6) when they cool, pull the peels off. 7) chop, dice, or run through a mill or processor. 8) use or store or freeze. The problem with warehouse shopping places like Costco is that when you are just one and a half people (little man being that half because he only eats half the variety that I do so far) the food comes in packages that are far more than you can consume before it goes off. We just can’t eat that many avocados or tomatoes or asparagus before they start looking nasty, no matter how good the price. But, I was tempted into sins of excess by a quart of bright orange tomatoes in a plastic shell that reminded me irresistably of Sungolds. 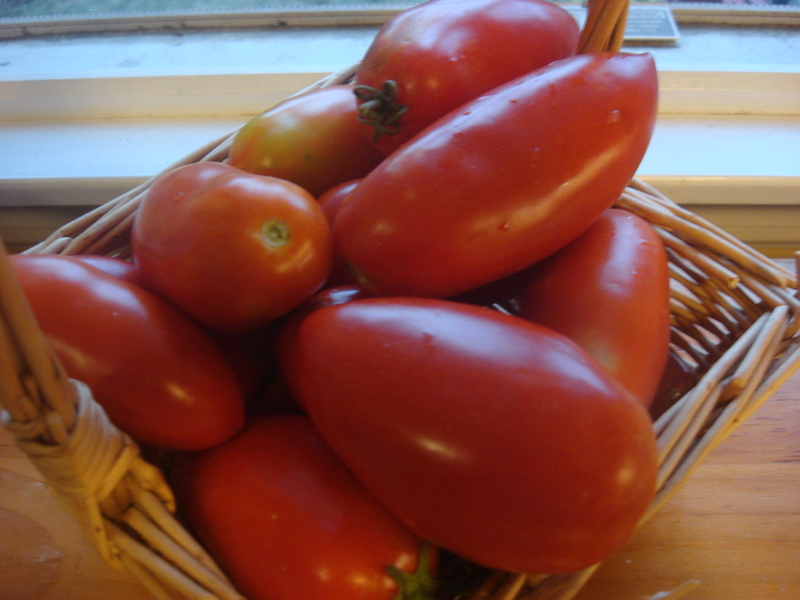 Why I was buying tomatoes out of season and out of state is a question you can reasonably ask. 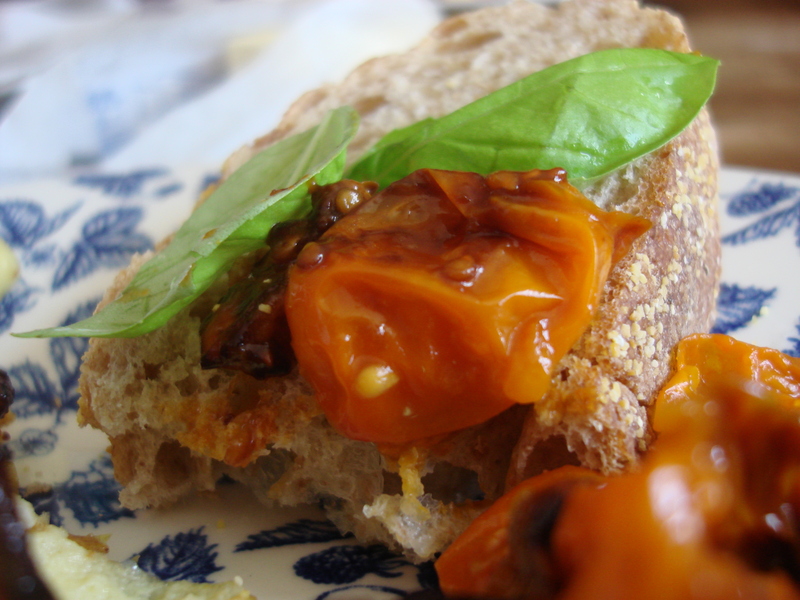 I hang my head in locavore-gone-wrong shame and go on with my story. I bought them. I did. They were delicious, ridiculously sweet and kept me on the salad path for days. That is a path I need to be on. But a week, two weeks later, predictably, the cup that was left had passed its prime and I had a locavore-gone-wrong guilt hangover. Solution? Pan-roasting. 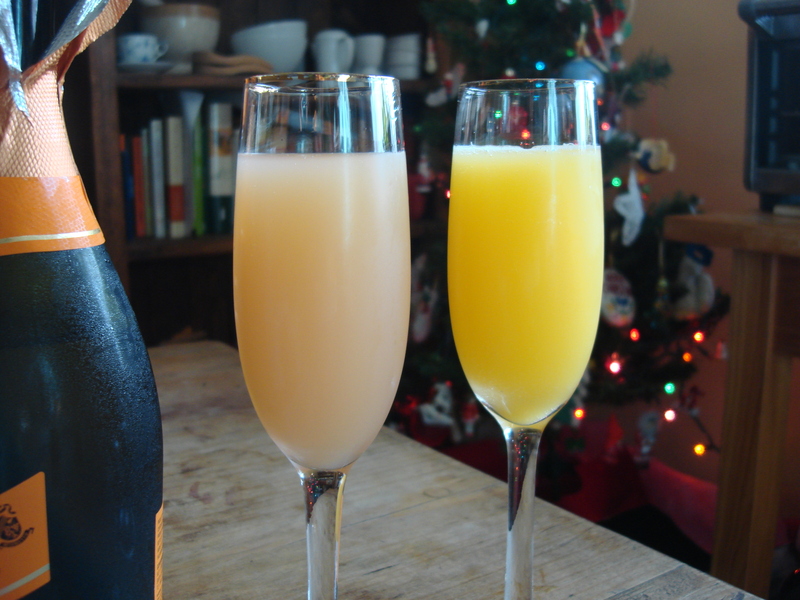 Our friend, Ashley had stayed over and it was a Saturday, which of course calls for bacon and eggs and Prosecco Mimosas (my new fave is pink grapefruit – 2 parts juice to 1 part prosecco…or 1 parts prosecco to two parts juice…or a glass of prosecco with a splash of juice….)! We added to that a leek saute (that Ashley will have to give me the recipe for; once she started fighting with the leek cleaning process, I backed away and didn’t look again until it was on my plate) and the following recipe that used up the tomatoes in a delicious and satisfying way! 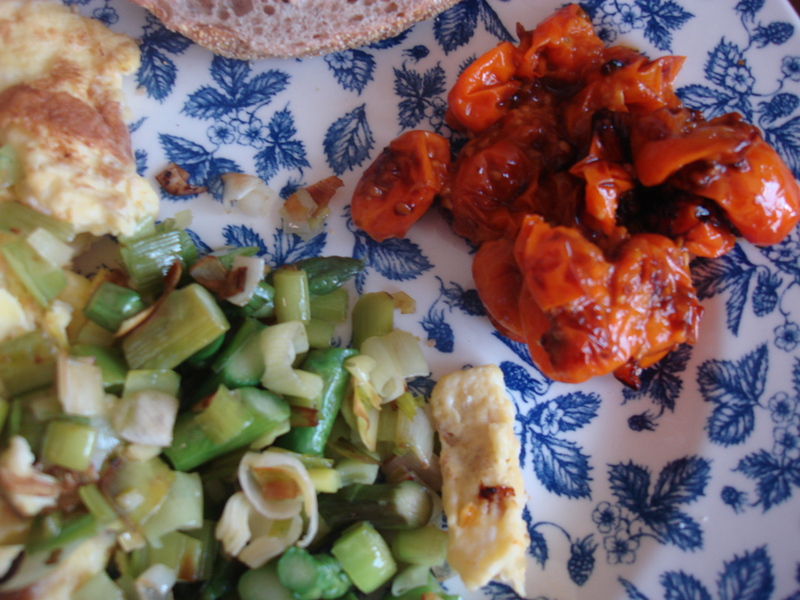 So, tomatoes used up, guilt assuaged, breakfast… delish! Place all ingredients (except optional basil) in a small skillet. 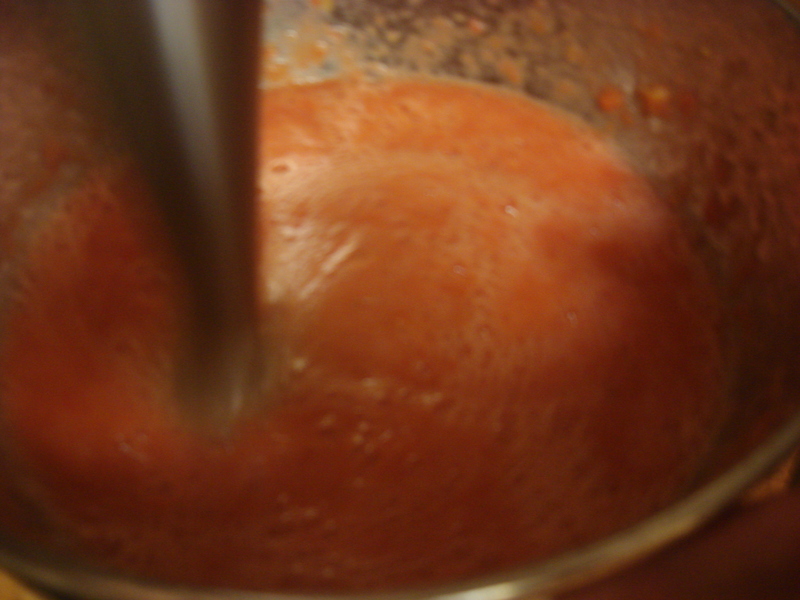 Heat at medium, stirring occasionally, until the tomatoes begin to split and char. Remove from heat and spread on toast. Top with basil.